"As the Government concludes its National Curriculum review, this timely seminar focuses on the content of the new curriculum for Design and Technology (D&T) for each Key Stage, due to be introduced into schools from September 2014 – as well as the implementation challenges for schools. It will bring together key policymakers with school and college leaders, teaching unions, universities, employers and other stakeholders. Delegates will assess the opportunities and challenges presented by D&T's designation as a 'foundation' subject, with a much less prescriptive Programme of Study, as well as the level of teaching time required to deliver the new Programme and whether it meets the needs of employers, colleges and universities. Sessions also focus on wider issues in D&T including the quality of facilities available in both primary and secondary schools in England, the profile and CPD opportunities for D&T teachers and the role that industry can play in the delivery of D&T in schools." 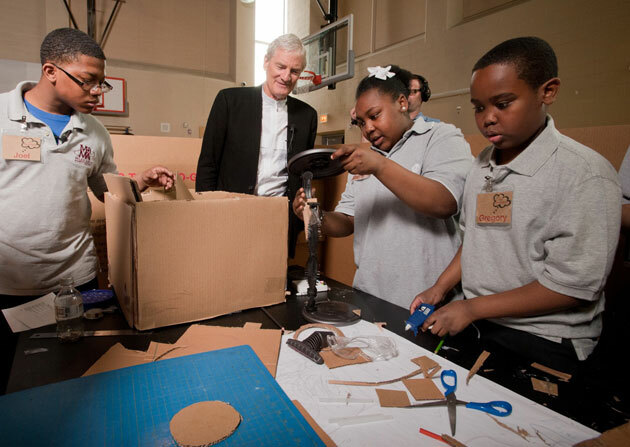 Fig.1 Chicago Middle School students participate in an invention school workshop led by James Dyson as the James Dyson Foundation begins its mission to encourage more American students to become future engineers and inventors, at the Sir Miles Davis Academy in Chicago, May 5, 2011 [http://momandmore.com/2011/05/james–dyson–foundation–just–launched.html].